Bob Ralston was a pianist on the Lawrence Welk Show from 1963 to 1982. Ralston was a child prodigy who was born in Los Angeles, CA in 1938. Ralston began performing while attending college at USC, playing for the Freddie Martin orchestra at the Coconut Grove on the Sunset Strip. Welk hired Ralston in 1963 as a member of the band. 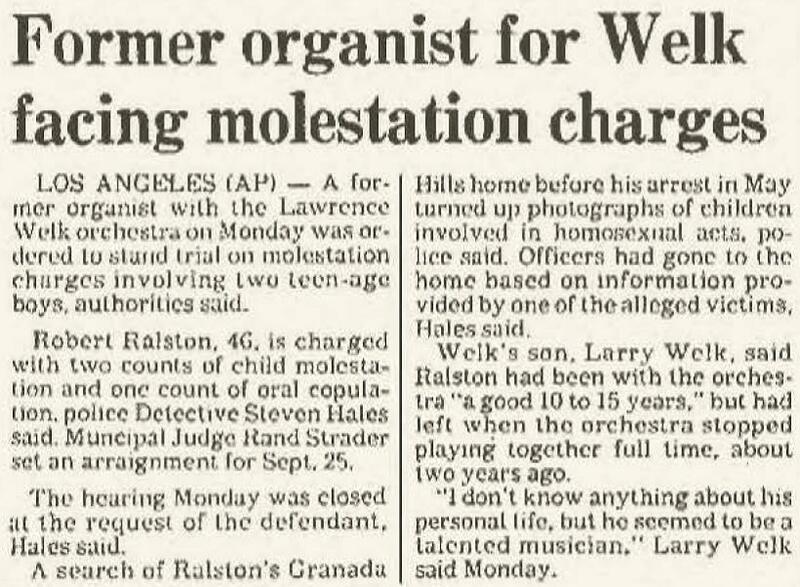 During the time fellow pianist and band member Jo Ann Castle was herself struggling with child molestation charges, Ralston too had his own troubles as well. Both Ralston and Castle later admitted their roles in child molestation activities to law enforcement. In 1984, Ralston was arrested for child molestation. In 1986, Ralston was ordered to undergo psychiatric evaluation for molesting a 13 year old boy and was placed on five years' probation after pleading no-contest to a charge of performing lewd acts on a child. He was also ordered to continue in a program of psychological counseling and to refrain from associating with children under 18 unless accompanied by a responsible adult. Today, Ralston and his wife Fiejte make their home in Granada Hills, CA.